Saturday night saw the ragged Rangers, residing in last place in the Atlantic, in the midst of another losing streak, this time a 3 game skein. They were visiting the Northeast leading Buffalo Sabres in an arena which has never been kind to the Blueshirts. This was the start of a brutal stretch of the schedule including another game with Buffalo, a game vs. Detroit and a trip to Chicago. This contest featured a matchup of probable starting goalies for the Swedish and American Olympic hockey teams -- Henrik Lundqvist and Ryan Miller. The official game recap lurks here. The game demonstrated that low-scoring hockey can be exciting as both goalies put on a demonstration in repelling 66 out of 69 shots while the goal posts demonstrated that they are a goalie's best friends as several shots clanged off the posts throughout the game. In the end, the Rangers channeled the ghost of head coaches past -- primarily, former Tom Renney -- to prevail 2-1 in a game that was reminiscent of the team's last victory, a 2-1 win on the road against Florida. play by the defense in front of the crease. As in the Florida game, the Rangers jumped out to a 1-0 lead in the first period. The play started with Marian Gaborik stripping the 6'8" defenseman, Tyler Myers of the puck inside the Sabres offensive zone. Gaborik led a rush up the right side of the ice and as he crossed over the blue line, a 2 on 1 had developed with Christopher Higgins on his left. Gaborik threaded a picture perfect pass about knee high between the defender's knee and stick that found Higgins in stride. He put the puck on the ice and then beat Miller over his right shoulder on a beautifully placed shot with with 2:31 left in the first period. For Higgins, it was his first goal in 11 games and 3rd of the season. For Gaborik, he has scored a point in 23 of the 26 games he has played for the Rangers this season. 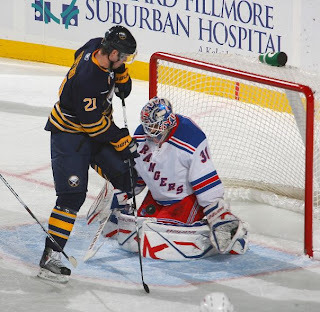 Throughout the game, the Rangers with their strong defensive play all over the ice kept the Sabres in check. The Rangers won many pivotal faceoffs. The fans were quiet as the Sabres could not mount any sustained pressure in their offensive end. Ranger defensemen kept the crease clear and the puck moved off to the side boards and the forwards controlled neutral ice. It was an even better effort (because of the Sabres' potent offense) than the Rangers showed against the Panthers. Drury was a big presence on both penalty units -- he shot several from the point on the powerplay and took an aggressive shoot-first attitude on offense. It appeared he had shaken off any lingering cobwebs from his concussion. Anisimov centered Gaborik & Prospal and looked fairly decent. Higgins played very strong as well as he looked to shoot. During a sequence late in the game when he saw Henrik over to the far right of the goal, he hustled over to cover the left post just in case to block a centering pass or confront a forward. Smartly done. It got to the point that the Sabres took turns head-manning the puck into the offensive zone to cross the blue line. With that effort, they started getting some choice opportunities which Henrik thwarted time and time again. Tim Connolly was especially successful in breaking in on net several rushes and was a big presence in the crease on several deflection attempts. 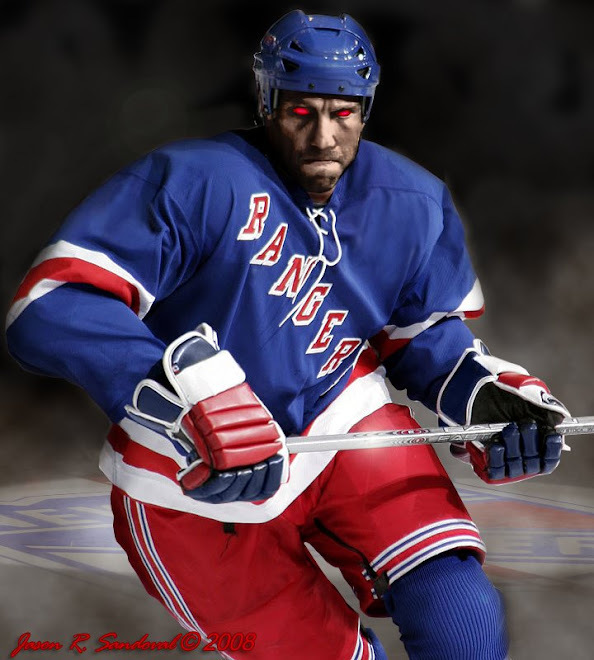 The ultimate for the Rangers' success was the fact that Henrik left few rebounds after initial shots. on his doorstep. Here, he denies Drew Stafford. With only 6 1/4 minutes left in the 3rd period and the Sabres starting to show more energy, the inability of Ryan Miller to prevent a rebound gave the Rangers an opportunity to extend their lead. Marc Staal led a breakout from the defensive zone with a sharp cross-ice pass that found Sean Avery at the blue line for a 2-on-1. Avery took the shot that Miller kicked out to his left which was immediately converted by Ryan Callahan (his 5th) for a 2 goal margin. It felt like it was Callahan's first goal since around the time the Yankees won the World Series. As you may recall, last week, the Rangers clung to a one-goal cushion in the Florida game which disappeared when the Panthers tied the game late at 1-1. The Rangers then won in a shootout. You had to feel better about the Rangers chances with a 2-0 lead and Lundqvist in net playing superbly. Needless to say, the Sabres got one back with a minute to go on a seeing-eye shot from Jason Pominville. The last minute of the game was intense as the Sabres buzzed all over the ice after pulling the goalie. Brian Boyle clanged a shot off the left goal post of the empty net that could have sealed the game. Buffalo came down the ice and had several chances to tie the game but failed. Mercifully, the buzzer sounded as the Rangers got control of the puck behind their net. It is nice for the team to win a game in regulation against a conference foe. Overall, this was an entertaining game. The goalies played tremendously, there was good scoring chances, good defensive plays. The Rangers played flawlessly for nearly the entire game. The quality of play reminded me of the games between the 2 teams in that memorable playoff series from May 2007. Unfortunately, with the teams of the past few years, the Rangers are having trouble scoring 3 goals a game. Their last 2 victories have been 2-1 affairs. Meanwhile, they got clobbered by the Lightning and the Pens when they permitted 18 goals to be scored. I remember the selling point of Tortorella's new style was an upbeat attack that would generate more goals. This has not been happening for some time now and this team has that eerily familiar look of an impotent offense despite the presence of Gaborik on the first line. celebrating a Rangers goal that did NOT involve Gaborik. The Rangers also had 3 new faces on their team. Backup goalie Chad Johnson did not play. But Erik Christensen and Ilkka Heikkinen (I think I have exhausted my quota of double "k"s for the rest of my life) made their Ranger debuts without incident. Of the 2, I noticed that Christensen resisted using his body a couple of times along the boards, which is not a good thing. But in fairness to him, he still is recovering from extensive shoulder surgery from the offseason. Heikkinen played smartly and blended nicely with the Rangers' overall defensive scheme. With the win, the Rangers caught the Islanders. There's an upheaval going on in the East as Tampa Bay and Atlanta have thrust themselves into the playoff race with recent hot streaks. The Isles have pulled themselves up into the realm of .500 respectability. on Long Island if the over-rated Flyers don't improve. 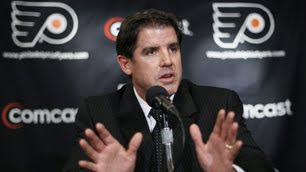 In case you missed it, on Friday, the Flyers, struggling overall, fired head coach John Stevens and hired Peter Laviolette. This has been rumored for the past 2 weeks or so in the Philly newspapers. Then in their first game at home, Philly proceeded to get blasted by the Ovechkin-less Capitals 8-2. That was a nice nightcap to the evening.